Reminder! 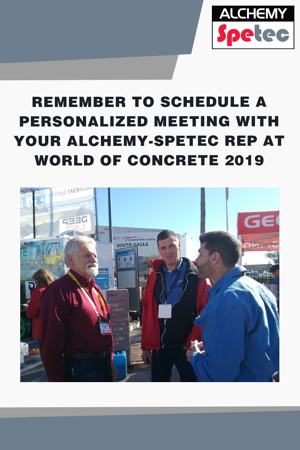 Book your personalized meeting with an Alchemy-Spetec rep at World of Concrete! Alchemy-Spetec will be at World of Concrete 2019! Drop by to see us at Booth # O40551 in the Silver Lots (same location we were in last year). See the Polybadger Lifting System in action. Learn about preventative waterstop products. Get in-depth instruction on using and cleaning the MixMaster Pro slab lifting gun. View leak seal and curtain grouting displays. Mix foam samples at our live mixing station. Learn about the Deep Lift process. Respecting YOUR time is important to us. So, in addition to the action-packed list above, you can schedule a one-on-one consultation with your regional rep for personalized product or equipment demos, tips and advice on building your business, etc. Want a personlized one-on-one meeting at World of Concrete?